I was blindsided by the skill and dexterity with which Susan Choi layers this novel. It's an alluringly complex study of what reality and consent really mean. Pair that with the backdrop of a performing arts high school, and you've got something golden. 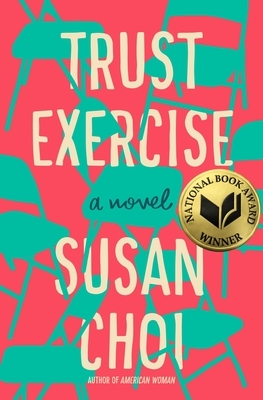 As captivating and tender as it is surprising, Susan Choi's Trust Exercise will incite heated conversations about fiction and truth, and about friendships and loyalties, and will leave readers with wiser understandings of the true capacities of adolescents and of the powers and responsibilities of adults. "Fans of experimental plot structure will find much to love in [this] spellbinding new novel." "Explosive. . . . [Trust Exercise] will linger long after the book ends." "This twisty novel . . . seems a straightforward enough story—until the roller-coaster second half makes you doubt everything that came before." "Superb, powerful . . . Choi’s themes—among them the long reverberations of adolescent experience, the complexities of consent and coercion, and the inherent unreliability of narratives—are timeless and resonant. Fiercely intelligent, impeccably written, and observed with searing insight, this novel is destined to be a classic." "What begins as the story of obsessive first love between drama students at a competitive performing arts high school in the early 1980s twists into something much darker in Choi's singular new novel . . . an effective interrogation of memory, the impossible gulf between accuracy and the stories we tell. . . . The writing (exquisite) and the observations (cuttingly accurate) make Choi's latest both wrenching and one-of-a-kind. Never sentimental; always thrillingly alive." "What a wickedly clever, formally inventive book Trust Exercise is. I was blown away by Susan Choi's literary vision, not to mention her sensitivity and wit." "Packed with the kind of shrewd psychological insights that make you sit up straighter, Trust Exercise is a frequently brilliant novel that draws you in slowly and carefully and then becomes increasingly hard to put down. I don't want to give too much away, so all I'll say is that the book is full of twists that are thrilling without being manipulative or melodramatic. I am sure I am far from the only one who had to put aside everything else while I raced to the end." —Adelle Waldman, nationally bestselling author of The Love Affairs of Nathaniel P.
"Trust Exercise is a brilliant and challenging novel, an uncanny evocation of the not-so-distant past that turns into a meditation on the slipperiness of memory and the ethics of storytelling. Susan Choi is a masterful novelist, who understands exactly where we are right now and how we got here." "An ingenious, morally complex exploration of how our youthful entanglements, cruelties, and traumas shape the rest of our lives. Choi’s writing is dazzling in its control and precision; this witty, sharp, unsettling novel grabs you and won’t let you go." "I can't remember the last time I had such a visceral reaction to a book, or was so dazzled by a writer's inventiveness with structure. Susan Choi is a master and Trust Exercise should be on every human's reading list. A perfect knockout, with profound things to say about art-making, adolescence, and consent." "This novel is a work of genius and should be a future classic. It has the most audacious narrative shift I've read since John Fowles's The Collector. Plus, it includes the phrase 'a virtuoso feeling-state lasagna.'"